Plan-B: Similar Places Nearby : iDid Inc. 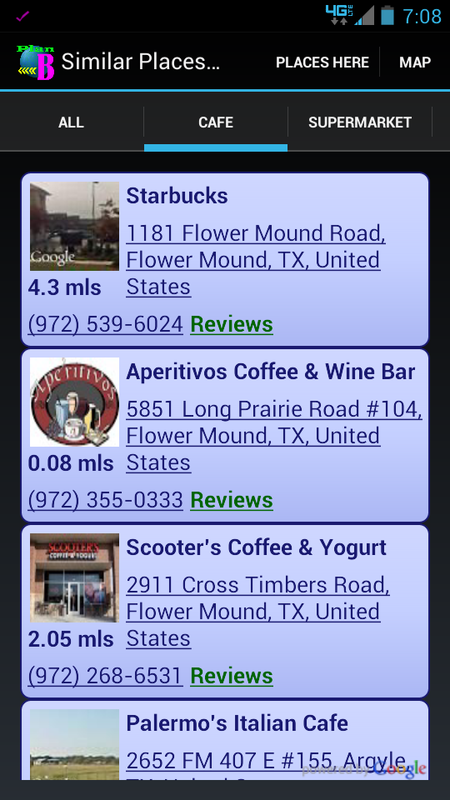 The app “Plan-B” is a quick way to find businesses nearby that are similar to the place you are in. It’s built to address the very familiar scene where you are somewhere and for some reason it’s not working out. Either a restaurant that’s too crowded or a car repair place that’s not treating you right. Use the Plan-B app to quickly discover similar places nearby without typing any searches. Comes in handy when a business is closed for the day or you are simply not finding what you are looking for. Just launch Plan-B. When Plan-B launches it gives you a list of places immediately around you. Select the place you are in and get other places like that place. It’s quick and simple. Other similar places are listed with place name, address, distance from where you are, phone number, link to their website and reviews. Couldn’t be more convenient. It’s great way to just learn of new places too – whether you are traveling or you are just re-discovering your local neighborhood. With Plan-B I discover new places all the time – a sushi bar I never knew existed or a new dry cleaner. Plan-B categorizes the results in tabs when applicable. For example, when you launch Plan-B from a general hardware store, you may find other hardware stores, general contractor stores and furniture stores – all in their own tabs. Plan-B automatically adjusts the search area based on the type of place you are in. It knows you have to go broader and wider if you are searching for another museum to see on your day off than if you had to pick another place for a quick lunch. Plan-B uses location services such as GPS on your phone to look up businesses and does NOT save or track your location. Filed in: Plan-B | Tags: app to find nearby places, discover new places app, find similar places, local businesses app, plan-b, similar places nearby, what's my plan-b?